Van Gogh, 1853-1890, one of the Netherlands’ famous artists in art history, painted one of his famous paintings "The Potato Eaters", in 1885. His art up until this time was of poor people, peasants, farmers, miners, basically people in difficult situations. The colors he uses in "The Potato Eaters" are as gloomy as the people he is portraying, blacks, browns and some green thrown in. The subject matter of the painting is humanitarianism and the life of working people. Vincent’s subject matter probably resulted from time he spent as a missionary from his father’s church to the slums of London, and the mines of Belgium. He much admired the art of Millet and his genre paintings. Traveling to Paris in 1876, Van Gogh stayed with his brother Theo. Because of his emotional, eccentric, and hypersensitive personality he had difficulty keeping a job and was a family problem. Theo supported Vincent while he studied art shoring up his draftsmanship with the artist Cormon. While in Paris Vincent met Pissarro who challenged him to use a more colorful palette in his artwork. Vincent van Gogh's art suddenly changed in one of his famous paintings “Factories at Clichy", 1887, a work very much different from his painting, "Old Shoes" painted in that same year. The "Old Shoes" still clings to the dull colors of his earlier artwork, but in theFactories at Clichy", the genre type subject matter of earlier work is gone replaced with a new style elongated brushstroke, unifying his compositions. "Pere Tanguy", another famous painting in art history, painted in 1887-88, seems to be where Vincent begins to realize where the power in his art paintings lay. Even though there are deficiencies in his drawing skills such as hands not fitting together properly, arms that don’t fit into the sleeves, and hips out of place, the power of his colorful brush strokes, and the presence of the figure itself, make us overlook the deficiencies. In 1888, Van Gogh again went to Paris to visit his brother Theo. This time Theo gave him money and found a place for him to live in Arles, where many of his paintings and artwork were produced. In Arles he had his famous quarrel with Gauguin and periodically in 1889, due to seizures he was in and out the asylum at Saint-Remy. While in the asylum at Saint-Remy, Vincent van Gogh painted one of his most famous paintings in art history, "The Starry Night". Shortly before his death, Vincent wrote a letter to Theo revealing his inner nature and his relationship to his paintings. "Really we can speak only through our paintings… In my own work I am risking my life, and half of my reason has been lost in it". Shortly after this unfinished letter Vincent died. Other famous artists of Impressionism are Paul Cezanne and Auguste Renoir. 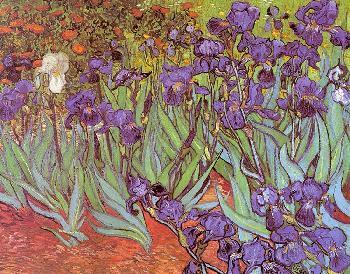 To view gallery 1, van Gogh posters, click here.